As far as the 2001 New York Underground Film Festival goes, I try as best as possible to put the rest of my life on hold. I still go to my job everyday, but otherwise I drop everything else, not that there’s much to drop really. However, I had promised a friend that I’d help her move. She was supposed to move last weekend, but the landlord and realtor screwed her over, so I ended up having to do it today. It didn’t help that she was moving into a 4th floor walk-up, either. I ain’t a very muscular guy. In fact, I’m a major wussbag. Even though we adopted a relay method for hauling junk up each floor, by the end of the move my arms and legs were still like Jello©. Still I trudged off to the NYUFF to make it in time for my first flick of the day, Maldoror. What a great concept film Maldoror is. Rather than having 12 separate incomprehensible experimental shorts, Maldoror strings together 12 incomprehensible experimental segments and calls it a feature. But, I kid, I kid. Maldoror is based on some 18th or 19th century episodic novel. The film is a coordination between an English filmmaker, Duncan Reekie, and a German filmmaker, Karsten Weher, who photocopied each chapter and sent them to different directors in their respective countries to adapt. Duncan & Karsten then collected each film, smooshed them together and wrote a connecting voice over for the whole project. Duncan was on hand to introduce the film and, as he put it, some of the filmmakers chosen for the collaboration either lost their chapters or didn’t understand them and made almost completely unrelated segments. The product thus provides an intriguing narrative thrust. Questionably about a man, named Maldoror, who loses his faith in life and God, the story can actually only be understood in brief moments; and possibly the best segment, a grotesque claymation animated sequence, seems to have little to do with any of the other segments. Or, the animation sequence could be the best adaption of the novel. I’m somewhat interested in now reading the book to find out what it’s all about. Here’s a pretty impressive official website for Maldoror. Continuing with the mind-messing of the day was Wired Angel, an epic experimental feature by Sam Wells. Angel is an oblique biopic of Joan of Arc told in a hallucinogenic haze of stark shadows & intense brightness. The cinematography, shot by Sam himself, is a revolutionary use of crisp black & white. Where most B&W films are actually muddled grays substituting for color, Angel is made of the pure absence of color and a sharp intensity of light. Before the film started, Sam claimed in his introduction that Angel did have a narrative, tho’ damned if I could follow one. The only dialogue in the film is a heavily distorted narration of Joan’s crams. The rest of the soundtrack, which I can only describe as indescribably, is piercing, thunderous and heaven-shaking. And though I am not the best audience for non-to-slight narrative films, particularly features, I found Angel riveting. It is a film, literally, quite unlike anything I have ever seen before. The final film I was able to sit through for the day without passing out from exhaustion was my 2nd most anticipated film of the fest, James Fotopoulos‘ Back Against the Wall. I think I gave James’ film last year, Migrating Forms, short shrift in my festival roundup. Part of the reason for that was the format I chose for the reviews, an “as-it-happens” journal type format. Had I given myself more time to reflect on the film, I think I would have given it the due it deserved. It was definitely the most haunting and memorable feature of the fest, memorable in the way that spiders crawling into your ear and laying eggs in your brain would be a memorable event. Back Against the Wall is more ambitious in scope than Migrating Forms, in storytelling and with more characters & locations, but it’s arguable which is more ambitious thematically. While Migrating Forms was more of an expressive exercise in structure and the mundanity of interpersonal relationships, Back Against the Wall develops the characters less and includes several jarring plot turns that violently whip the film into whole other directions It’s almost as if the movie is three interconnected shorts, all of which with no discernible beginnings or endings. I found that at each radical turn taken, it threw me out of the film for a few beats until I could once again get my bearings. But that’s the beauty of a Fotopoulos feature — Wickedly experimental and questioning of the basest concepts of narrative structure. 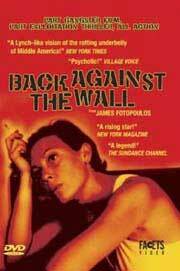 Also, exquisitely shot in a loveless black & white with a minimalist soundtrack, and amorphous dialogue and mysterious acting, Back Against the Wall is a brutal, engaging experience more than a mere film. Finally, preceding Back Against the Wall was James Fotopoulos’ short, Breathe. This is the second Fotopoulos short I’ve seen and I just don’t really get them, but that’s alright. Continue on to 2001 NYUFF: Day 5: George Kuchar & Friends. Go back to 2001 NYUFF: Day 3: Satan Was A Lady & More.